Prime Minister Justin Trudeau calls after a Grassy Narrows protestor at Liberal Party fundraiser. It turns out Mark Calzavera of Council of Canadians, well-known to those who stood at the gates of Site 41, was part of the party fundraiser action that revealed a mean spirit behind the pleasant face of the Liberal Party. Below is Mark’s email – please add your voice to those asking that things be made right for Grassy Narrows. Give them decent disability benefits and an on-reserve survivors’ centre, continue the health studies started by the late Masazumi Harada and his team of Japanese specialists, find the mercury barrels, and finally clean up the contamination of their river and territory! Whatever it costs! 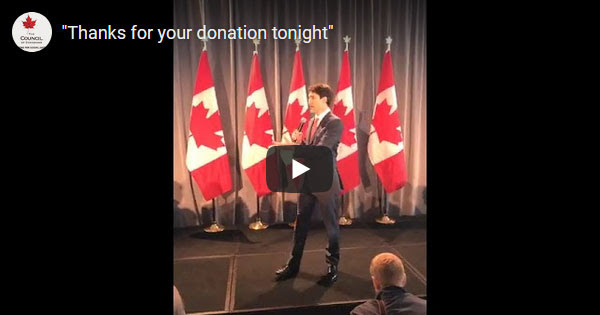 From Mark – Last week, I gave $125 to the Liberal Party of Canada. That was the price of joining their exclusive “Laurier Club,” which gave me access to a swanky high-end donor event featuring Prime Minister Justin Trudeau in a luxurious Toronto hotel. Dressed in my Sunday best and accompanied by Lana, a fellow Grassy Narrows supporter, I ate canapés amongst a few hundred Liberal donors, and waited for the Prime Minister. When he appeared, I started broadcasting live video to the Council of Canadians’ Facebook page from my smartphone as Lana slipped under the velvet ropes in front of the stage. She unfurled a banner and reminded him that people were suffering from mercury poisoning in Grassy Narrows. I was surprised by the Prime Minister’s reaction. We expected, and we were prepared, for him to engage us as he has engaged other protesters in so many similar circumstances. His dismissive and sarcastic response “Thank you for your donation” made headlines internationally. The issue has never received more attention thanks to that short video, which has now been watched more than half a million times. The goal of this action was to remind the Prime Minister of his government’s commitment to provide a mercury treatment centre for Grassy Narrows First Nation. That promise was made 500 days ago and progress has been worrisomely slow. All of the tireless work the people of Grassy Narrows put into getting that commitment is in jeopardy. The federal government may change in October and incoming governments never feel beholden to honour the commitments of previous governments. That is why it is urgent that you act now to ensure the federal government commits the necessary funds. The money must be put into a dedicated trust that can only be used for the mercury treatment centre. Kathleen Wynne’s government did that to protect the commitment they made to Grassy Narrows to clean up the Wabagoon River. Ontario Premier Doug Ford can’t touch that account. Can I count on you to send a letter to Prime Minister Trudeau calling on him to honour his government’s commitment? The Prime Minister must correct this outrageous injustice which has been ignored by every government of every party for the last 50 years. Win or lose in October, at least he would have this particular legacy to be proud of. Prime Minister Justin Trudeau was confronted by protesters who hoped to draw his attention to mercury contamination in the First Nation communities of Grassy Narrows and Wabaseemoong during a Liberal fundraiser in Toronto on Wednesday night. That was according to a video posted to Twitter that showed Trudeau delivering a speech during the Laurier Club event at the luxury Omni King Edward Hotel. Laurier Club members are considered high-end Liberal donors who must contribute a minimum of $1,500 in order to join the ranks. “Mr. Trudeau, people at Grassy Narrows are suffering from mercury poisoning. You committed to addressing this crisis,” a protester could be heard saying as she held up a banner calling on the prime minister to compensate people within the community. The protester was subsequently ushered away. That’s when Trudeau addressed her directly. “Thank you for being here, thank you for your donation tonight. I really appreciate it,” he said, to laughs, applause and cheers from the audience. The event post went on to say that all but six per cent of Grassy Narrows people have received “no compensation for the intense impacts of the ongoing mercury crisis on their health, culture and livelihood. Philpott, who has since left the Liberal cabinet, indeed pledged federal funding to the Grassy Narrows First Nation to fund a treatment centre to help people suffering the effects of mercury contamination. Mercury contamination has been an issue in the area for half a century, after a paper mill located in Dryden, Ont., dumped thousands of kilograms of mercury into the English-Wabigoon river system in the 1960s. “This is what they need and should have, and we are very happy to support them in it,” Philpott said at the time. A health survey published by the Grassy Narrows First Nation last year showed that the health of people there was “significantly worse” than other First Nations in Canada. The community had fewer elders, and this survey suggested that people there were dying prematurely. The Supreme Court of Canada has said it will hear a case over whether Ontario’s provincial government can force Weyerhaeuser Co. and Resolute Forest Products to clean the former mill site in Dryden. The provincial government had ordered them to clean the site in 2011, but they claimed they had received indemnity. An Ontario Superior Court judge found in the companies’ favour in 2016, but the Ontario Court of Appeal overturned that ruling. The government has also been handing out mercury disability payments to over 200 people in the Grassy Narrows and Wabaseemoong communities. Prime Minister Justin Trudeau is apologizing after he sarcastically dismissed demonstrators who paid to attend a Liberal fundraiser in Toronto Wednesday night to voice concern about mercury poisoning at the Grassy Narrows First Nation. The comment is met with laughter and applause from people attending the Liberal fundraiser. Speaking to reporters in Halifax Thursday morning, Trudeau said he was sorry and that the party will refund those who paid to attend the event to raise the issue with the prime minister. “It is obviously an issue that they feel very, very — take very seriously, and as I know, understand it involved their child possibly,” Trudeau said. “The situation in Grassy Narrows is one that we have been following for quite a while,” he added, stating his officials will check with Indigenous Services Minister Seamus O’Regan to make sure the government is doing everything it can to resolve the situation in the remote Ontario First Nation. “I always try to be respectful…I didn’t do that last night. Last night I lacked respect towards them and I apologize for that,” Trudeau said. The Star has reported extensively on the effects of an industrial mercury dump 50 years ago upstream from Grassy Narrows First Nation, revealing that fish near the community are the most contaminated in the province, that there is mercury-contaminated soil and river sediment at or near the site of the old mill, and the provincial government knew in the 1990s that mercury was visible in soil and never told anyone inGrassy Narrows or nearby Wabaseemoong (Whitedog) Independent Nations. New research reported in December indicated children in Grassy Narrows whose mothers ate fish at least once a week while pregnant are four times more likely to have a learning disability or nervous system disorder. People in the community have also developed tremors, slurred speech, impaired hearing and tunnel vision, and lost muscle co-ordination, the Star has reported. On top of that, the fishing industry in the region has been decimated. Trudeau’s jibe toward demonstrators at the Liberal fundraiser was greeted with criticism. Perry Bellegarde, National Chief of the Assembly of First Nations, posted on Twitter that Trudeau’s comments “unacceptable and offensive” and said he should apologize directly to those involved. NDP Leader Jagmeet Singh told reporters on Parliament Hill Thursday that Trudeau’s comment was “callous.” He called the situation in Grassy Narrows a “horrible tragedy” that should be approached with compassion.